Rounding out Tessa Dare week is this delightful novella about our sweet, asthmatic Diana Highwood, one of the spinsters of Spindle Cove. We have seen how her mother has been bullying her to marry a titled Lord and how Diana has done everything in her power to thwart her mother’s intentions all because she is in love with the town blacksmith, muscular, handsome commoner, craftsman, Aaron Dawes. Tessa Dare can sway us to totally fall in love with her characters. We want for Diana what she wants and for Aaron what he so rightly deserves. She shows us why these two are meant for each other and she does it with her signature witty dialog and her boundless sense of humor. This is the last Spindle Cove novella before the full length Spindle Cove novel ANY DUCHESS WILL DO, which debuted last Tuesday, May 28, 2013. ( I am reading it now and loving it!) I think I’ve said it before but I would love to step back in time and spend a holiday in Spindle Cove. What fun to go on the outings with the ladies, learning to shoot pistols, meeting for tea at the Bull and Blossom and don’t forget how all those hunky gentlemen just happen to come to town and sweep pretty, sweet someones off their feet. Yes, this book was released on Tuesday and here it is Thursday and I’m ready to review it. This was such a delight to read that I could not put it down until it was finished. And then I was sorry it was over. Tessa Dare had me rolling on the floor with laughter and a few pages later dabbing tears from my eyes. Any author who can wring those emotions from me deserves a 5-star review. This was a Cinderella story (Pauline actually loses a shoe running from the ball) crossed with Pygmalion. The Dowager Duchess, Griffin’s mother, is delightful and sincerely wants him to be happy so she is doing everything in her power to turn Pauline into Duchess material and failing that, has no qualms about just throwing them together. Pauline is convinced that marriage is not an option and we need to turn the pages quickly to see how this impossible union could possibly happen. Once again from this author we get superb, witty dialog. The scenes are sometimes heart wrenching and at other times hilarious. The characterizations are spot on. Because of a foolish mistake in her youth, she’s not allowed “out” in Society until her three older sisters are wed. But while she’s trying to be good, she keeps bumping elbows—and, more distressingly, lips— with notorious rake Harry Wright. Every moment she spends with him, she risks complete ruin. The sensual passions he stirs in her are so wrong . . . but Eliza just can’t resist Mr. Wright. This is another Classic Tessa Dare. 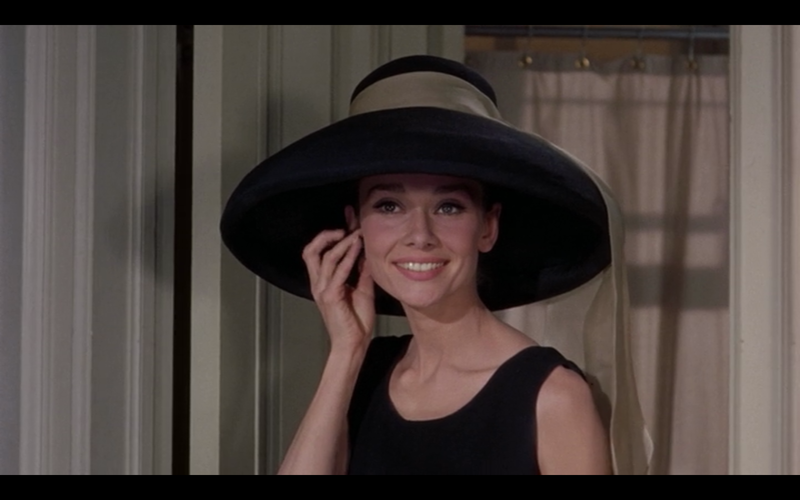 There is witty repartee, a hero to swoon over, a naïve, sweet heroine and just enough angst to keep it all interesting. Not to mention a satisfying steamy scene. This is a favorite of mine. This novella does not connect to any of Ms Dare’s series, it stands alone. I recommend it to all Tessa Dare fans and anyone who wants a light hearted, humorous, book that can be read in an evening. Today is the Release Day for this, the next Spindle Cove Series novel. I’ll be getting mine today and will have a review up very soon. After years of fending for herself, Kate Taylor found friendship and acceptance in Spindle Cove–but she never stopped yearning for love. The very last place she’d look for it is in the arms of Corporal Thorne. The militia commander is as stone cold as he is brutally handsome. But when mysterious strangers come searching for Kate, Thorne steps forward as her fiance. He claims to have only Kate’s safety in mind. So why is there smoldering passion in his kiss? Long ago, Samuel Thorne devoted his life to guarding Kate’s happiness. He wants what’s best for her, and he knows it’s not marriage to a man like him. To outlast their temporary engagement, he must keep his hands off her tempting body and lock her warm smiles out of his withered heart. It’s the toughest battle of this hardened warrior’s life…and the first he seems destined to lose. Tessa Dare has another Spindle Cove Series novel being published tomorrow, May 28,2013, ANY DUCHESS WILL DO. A LADY BY MIDNIGHT, is the full length novel that precedes along with the novella, BEAUTY AND THE BLACKSMITH, which I will review on Friday of this week. All novels in this series are stand-alone but they are all delightful so don’t miss any. Tessa Dare can write dialog better than most. She is witty and light hearted with her characters. She creates a place that is fairytale happy and we all want to travel back in time to holiday at Spindle Cove. Most of the mishaps are of the silly sort and we know that somehow Kate will convince Thorne that they are meant to be together in spite of the not so terrible lies of omission. This is classic Tessa Dare, sweet, lovely and so hot the pages scorch. Estranged from his family, widowed after an unhappy marriage, and weary from fighting his troubled past, Ethan Grey now has a chance for redemption. His son’s beautiful and remarkable governess might help him battle his ghosts, but it’s been a long time since he let himself get close to anyone. Alice Portman has more in common with Ethan than she can comfortably admit. For now, she’s satisfied with helping him rebuild his life and family. But the dangerous past is about to catch up with them both. An unforgettable Regency tale of two wounded people who get another chance at love. 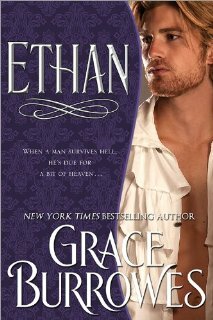 Ethan is my favorite hero in this series…so far. I do like him so much more than Nicholas but that said, Nick shows up in this book and he’s much more likeable. I like the story and how the characters appear in each book. I like how Burrowes deals with the romance even though I think the prim governess falls a bit too quickly for the charm of our hero. Alice is the perfect person for Ethan and even though they both have scandalous pasts they are meant to be together. Since I am reading an Advance Reader Copy it is difficult to say if the few negatives I have will be sorted out in the release of the finished book. So I will not mention them in the hope that editing for continuity will solve all the issues. Because other than minor but frustrating moments this is an enjoyable series that sets us down in the time period. An extraordinary and passionate tale of courage tested and fears overcome. Once you enter the lush Regency world of award-winning New York Times and USA Today bestselling author Grace Burrowes, you’ll never want to leave. First let me say that I did not read the first book in this series, DARIUS. I don’t know if having read that book I might have had a different understanding of the characters in this book. Leah is Darius’ sister and there may have been more about her in the previous book. I will rectify my lapse and get a copy of DARIUS post-haste. I have to say that I did not like Nick for most of this book. He was hiding secrets from Leah and she was left to make wrong assumptions and her heart was nearly broken. The reader was left to assume the worst. But even though I wanted to shake some sense into our hero he managed, through the help of some very wise side characters, to redeem himself. So dear readers one must never give up on a true romantic hero even if he has been acting like an idiot most of the book. And Leah is a paragon of a loving wife, she forgives all. Grace Burrowes pens a very realistic historical romance. She has the ability to bring the scene alive as if we have been set down in the time period. As much as our H/h are in the throws of emotional upheaval, so are we the reader as we quickly turn the pages to discover what will happen next. The romance is passionate, the writing style is well done. Charity Barlow wished to marry for love. She and Lord Robert have been forced by circumstances to marry, and she feels sure she is not the woman he would have selected given a choice. The Marquess of St. Malin makes it plain to her that their marriage is merely for the procreation of an heir, and once that is achieved, he intends to continue living the life he enjoyed before he met her. While he takes up his life in London once more, Charity is left to wander the echoing corridors of St. Malin House, when she isnt thrown into the midst of the mocking Haute Ton. Charity is not at all sure she likes her new social equals, and shes not at all sure she likes her new husband either, except for his striking appearance, which sends her pulses racing. Lord Robert is a rake and does not deserve her love, but neither does she wish to live alone. Might he be suffering from a sad past? I confess, I’m addicted to free Kindle books. There are many added each day and I download at least one a day, sometimes more. Of course, I have not read them all. They just stack up in my Kindle but my Kindle holds over 3,000 books so I’m still good to go. Anyway…. I downloaded this book against my better judgment. I saw that it had more 3 star reviews (meaning it was “okay”) on Amazon than 4 or 5 star reviews. Hm-m-m, I thought maybe I don’t want to waste my time with a book that is mostly “okay”, even if it is free for today. As you can see from my rating, this book was better than okay. It was a good read. So don’t always believe all those ratings, if it looks like a book you might enjoy, give it a chance. This book was well written, characters were well developed. The plot was interesting and I felt like there was a good deal of historical accuracy. It was compelling to see how the author turned these two people, in an arranged marriage, and brought them to the point of a loving marriage. It was romance with all of the ups and downs and believable problems that these two individuals had to deal. 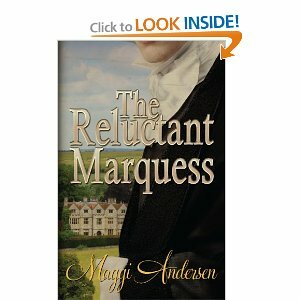 Maggi Andersen is an author to watch. Lady Sabrina Grayson is determined to avoid the kind of reckless love that ruined her mother’s happiness, instead setting her sights on a very sensible alternative: Lord Francis Fairford. But before she can attract his notice, a very different sort of man enters her life. He’s everything Sabrina thinks she doesn’t want, yet her traitorous body says otherwise. Sabrina is nineteen and having her first season where she expects to land a husband. She wants a man who is compatible, but not one she can fall in love with. Her father and mother had a passionate love, but after four daughters he became a philanderer and Sabrina witnessed her mother’s distress. Sabrina thinks if she doesn’t love her husband then she won’t care what mistresses he takes. Lord Montgomery arrives on the scene, after knowing her as a pesky nine year old, to fall in love with her and to make her fall for him. Sabrina is steadfast in not marrying for love and sets out to find suitors that don’t “stir her blood”. This leads her to break a few hearts and also to a dangerous liaison. This is another delightful novel from Liana LeFey, her first being Countess So Shameless. We have a headstrong , often immature heroine but one who is most likely acting her age. We have a to-die-for hero who does act his age. There is romance, danger, action and heated encounters. The plot is original in a genre that is often not very original. Ms LeFey leaves us wanting more from her, I can’t wait for the next book.